You'll need a place to store your sweet loot while you're out adventuring. You can either keep it in your Backpack or in a Warehouse. Players all start the game with a single backpack, as well as the space for up to four backpack expansions. Rare bags offer more space, which you'll find you ALWAYS need. Backpack expansions can be removed or replaced, but they must be empty first. Hover your mouse pointer over the bags to view their number of available slots. An extremely convenient feature of the backpack system is the Backpack Manager. Access your manager at any time by clicking the blue hand icon at the bottom of your backpack window. From here you can customize your manager to make your adventuring easier. Auto Discard WHT/GRN: Bag space is precious, and sometimes you only want to keep really valuable items. 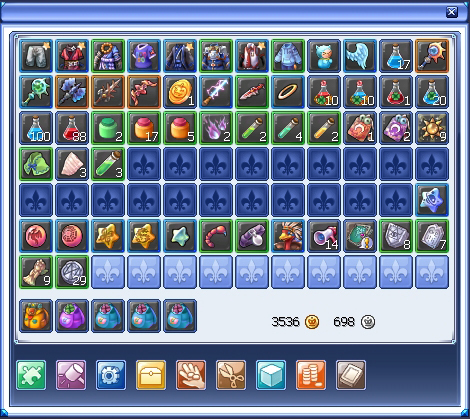 Checking this option automatically trashes white items (which are useless and sell for very little) and green items (which are low level magical items that sell for very little) to save space. Auto Sell WHT/GRN: Selecting this feature gives you the option to automatically sell all white and green items whenever you visit a merchant. Simply press the Auto Sell button at the bottom of their window. Characters each have their own bank space for storage, called a personal bank. You can access your bank at any time in Aven or in your Guild Town. Much like your backpack, you can add more space to your bank with expansions. However, before you equip a bank expander, you must first rent an additional bank slot to place it in. Rental contracts can be purchased in the Item Mall. Remember, however, that items stored in your bank can't be accessed out in the wilderness, unless you purchase a Portable Bank. Your final storage option is the archive. This special feature differs from your warehouse and inventory. Its purpose is to act as a sort of trophy rack for your most impressive loot. Only Item Mall items and high-end rare items have a spot in the archive. Remember that your archive is bound by account, not character. This means that any equipment you put in your archive can be accessed by any of your characters. Your archive will also display all the items that are archivable, so you can see exactly what you have left to collect.